"The financial crisis is not over, the recovery is not real, and the U.S. faces a far worse crisis than the financial one." – assistant Secretary of the Treasury during President Reagan’s first term, former associate Editor of the Wall Street Journal. Be a WINNER NOW and for the NEXT 20 years - no matter what! 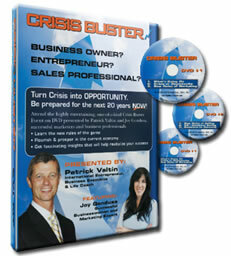 You can learn how to handle and overcome the economic crisis during this amazing, once‐in‐a‐lifetime business event! ensure your success, RIGHT NOW! 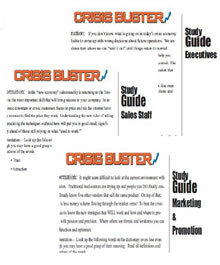 Economic Crisis Secrets Revealed: what you should know and how to stop being affected by it. These easy-to-implement principles will help you reach or recover financial success in your business and in your personal life. New Market Rules – why traditional marketing and sales strategies are doomed and what will work next. Actually, these new rules apply NOW! A New Era of Selling – forget the old tricks of the trade. Your biggest challenge today is NOT selling, but building trust and credibility to get that person to be sold on YOU first! Smart Marketing Strategies - How simple, but powerful new rules can help boost your direct sales results and income – they actually are very affordable and come without technical hassle! The New Rules of Financial Success – forget old investment strategies. Find out what you can do NOW to create financial freedom and certainty – no matter where Wall Street goes. 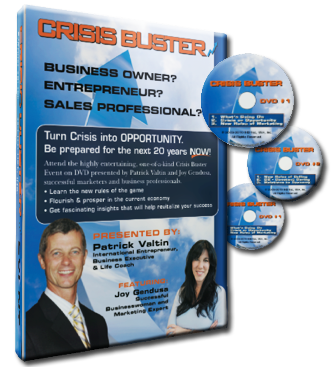 Patrick Valtin, author of "Crisis Buster" and founder of M2-TEC USA, Inc.
Patrick Valtin has personally trained over 75,000 business owners and sales professionals in 27 countries. He developed the New Era Selling system, the most down-to-earth and result-proven sales approach to selling in tough economic times. Patrick is also the founder of the biggest training/consulting company in Europe, licensed to deliver the Hubbard® Management Technology. He made more than one thousand millionaires through his unique teaching and coaching of such principles. Patrick will share with you how to sell your product or service in any kind of economic environment. Joy Gendusa, founder and CEO of PostcardMania, Inc.
Our special host speaker, Joy Gendusa, is a national celebrity in the direct marketing business. Using a powerful, simple but extremely cost effective way of communicating with customers has earned Joy’s company Inc Magazine's recognition as the nation’s fastest growing direct mail postcard-marketing firm, with year 2008 revenues close to $19,000,000. She began in 1998 with zero investment capital. Today, PostcardMania employs over 150 people; prints and mails 4 million postcards each week. 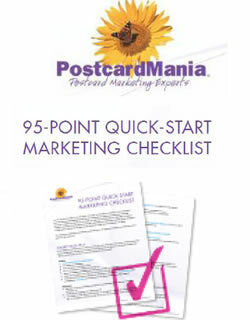 PostcardMania has over 35,000 customers in more than 350 industries. She was recently awarded the Tampa Bay Business Journal woman of the year and was featured on Your Business on MSNBC. 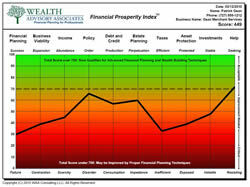 Christopher Music, President of Wealth Advisory Associates, a Registered Investment Advisor. Christopher is a 15-year member of the Financial Planning Association (FPA) and the International Association of Registered Financial Consultants (IARFC). He is also a Certified Wealth Preservation Planner (CWPP™), a Certified Asset Protection Planner (CAPP™), a certified business consultant, and is the Florida State Representative of the Asset Protection Society (APS). Founder of the Clergy Benefits Group in 1992, Chris sold his practice in 2002. He has since been serving hundreds of wealthy clients from his Clearwater, Florida home. 3 DVD's packed with down‐to‐earth, result‐proven tips and advices, given by worldwide professionals and business consultants who live to help others. Stop getting hurt or affected by "big government" crisis-driven policies and regulations. Get new sales and marketing rules under your belt. And see many of your competitors disappear. Learn the new rules of financial independence. Stop making the banks rich and start building your future financial freedom... NOW! 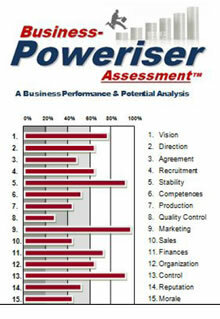 The Business Poweriser™ Assessment is a unique diagnostic tool to help you detect what needs to be done NOW in order to quickly transform your business into a more effective money‐making machine. What is the most important criterion to success... missing in more than 90% of businesses? work hard for you and contribute to the company’s vision & purposes? What is a vital condition for raising profitability FAST? Each "Study Guide" is a step by step approach the person can follow when viewing the DVDs, including practical exercises that get the individual to apply the "new techniques". Part of being successful is having your entire team understand what will be necessary to win, and the DVDs + "Study Guides" can help greatly. You'll see what actions you should take as a beginner and intermediate marketer – plus, even get a glimpse of what really advanced marketers are doing. This checklist will definitely help you optimize your marketing efforts. Based on the experience with over 38,000 customers, this checklist has helped its author develop a strong leadership in the field of marketing support and services, across America. "How do we handle these tough times, knowing that every one of your customers is having the same problems you have? Well, you are going to have to change your mind from being a business owner or a sales person to being someone on a mission to help your customers survive better – in business and in life!" "Anyone starting a business or struggling with running one should attend this event. I gained valuable information about buyers motivation in this tough economic climate, and I feel I have real‐world tools that will help motivate potential customers." "This has been by far the best Sales & Marketing event I’ve ever been to! What more can I say?" "This event was mindblowing. I expected a LOT but Patrick truly overdelivered! His advice is invaluable and has completely changed my viewpoint on marketing and selling. I have never been a sales person and never had the confidence to be one, but after this seminar: this has changed. I know I can now sell – no matter where the economy is going." "It was so great! Very informative and wonderful. So much exchange in abundance: very impressive! I'm very impressed with each person and their willingness to share their success. There was nothing I can't use here - all valuable and so helpful. All my thanks." "My viewpoint has shifted 360° with this event along with my attitude. The information provided over the two days was invaluable. I now have the tools to salvage my business and prosper. Networking was great and I met some amazing people. Thank you!" "Outstanding event! I got some excellent tools that I can use in the business. I can't wait to go apply them! I recommend this event to all business owners and executives, no matter how small or big they are. Thank you so much!" – E.C., president of a software company. "This was a fantastic event. The flow was perfect. Kept the interest level high. All the information was applicable with "meat and potatoes" data that can be immediately implemented. In fact, by changing my viewpoint and understanding it, it has indeed gotten the stated result: Done deal! Crisis busted! No more crisis in my life!"